Vaginal dryness is a symptom of menopause experienced by up to 80% of middle-aged women. It can be difficult to know which treatments are effective and carry less side effects, because every woman experiences vaginal dryness differently. If you're looking for healthy and alternative ways to treat your vaginal dryness, try these three foods that are sure to make your vaginal dryness a little more manageable. Soy is rich in phytoestrogens (a plant-based form of estrogen) called isoflavones, as well as protein, omega-3 fatty acids, calcium, folic acid (vitamin B9), iron, and other vitamins and minerals. Adding soy to your diet has many health benefits that can help your body cope with menopausal symptoms such as vaginal dryness, hot flashes, and night sweats. Try to aim for 25 grams of soy protein a day to see noticeable improvement in your menopausal symptoms. Soy is found in a number of products, including soymilk, tofu, roasted soy nuts, soybeans, and even meat and dairy substitutes such as soy hot dogs, soy cheese, and soy ice cream. Flaxseed, similar to soy, is rich in phytoestrogens and high in omega-3 fatty acids. Phytoestrogens found in flaxseed can help increase estrogen levels and combat vaginal dryness, and they're known to help relieve a variety of other menopausal symptoms as well. Flax can also help lower LDL (bad cholesterol). Flaxseed can be purchased at most health food stores. Grind it up and sprinkle it on cereal, smoothies, yogurt, salads, and anything else you can think of. Much like flaxseed, many kinds of fish are rich in omega-3 fatty acids as well as a number of essential oils. While fish oil capsules are available in most health stores, it's always better to simply incorporate fish into your diet. Salmon, tuna, cod, and other species of cold-water fish are easily available frozen, fresh, or canned. 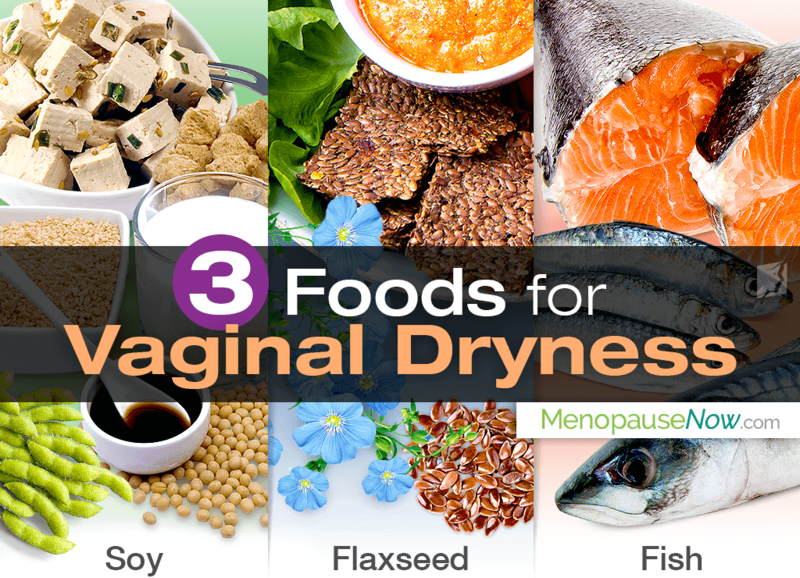 While these foods may help ease the symptoms of vaginal dryness, severe cases may require additional care. Read more about how to combat vaginal dryness.